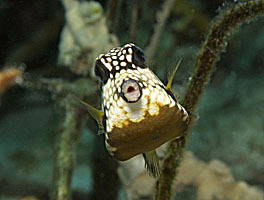 Click here to this Smooth Trunkfish face to face at Calabas Reef near the island of Bonaire. 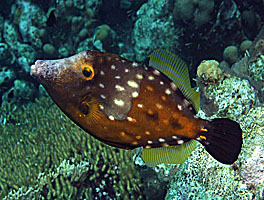 The Whitespotted Filefish sometimes doesn't show its spots, but this picture shows them clearly. Click here to see this fish in all its glory. These Dead Man's Fingers tell a tale of a healthy coral reef. Click here to see this coral and the beautiful Blue Chromises swimming nearby. 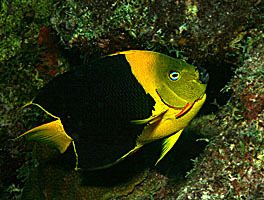 The Rock Beauty Angelfish is really shy, but this pictures was close enough to show some unusual red markings. Click here to see this fish up close. Thanks for reading this issue of e-ReefNews! Please share our newsletter and website with students and teachers you may know. 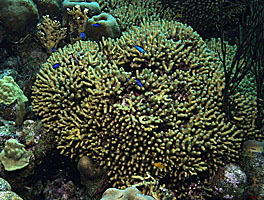 Copyright © 2005 ReefNews, Inc.
ReefNews ® is a registered trademark of ReefNews, Inc.